How do you measure and track activities on multiple social networks? Our powerful analytics can help! Get complete social analytics for each profile as well as your posts and tweets. Find out how social impacts your website traffic. Connect your Google Analytics to help you track key metrics like traffic sources, time spent on site, and much more. 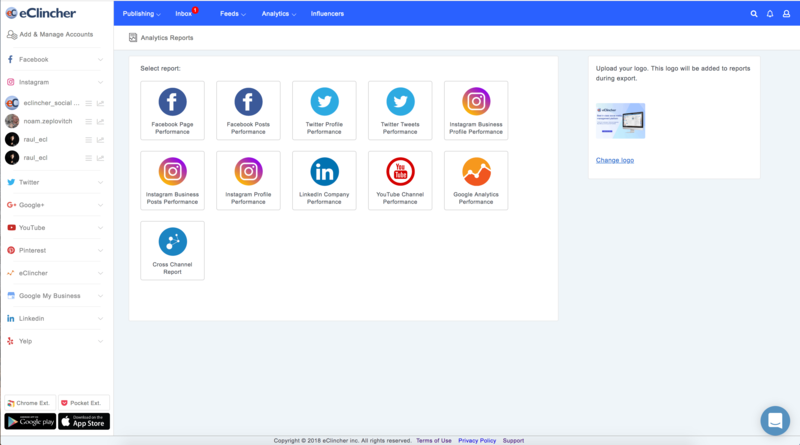 Social Media Analytics: Analyze your social accounts with Social Analytics. Understand follower trends, how often your brand was mentioned, how well your posts performed, when your audience is online most and much more. Easy-to-understand graphs make understanding analytics possible for everyone. Re-post from Social Analytics: Did one of your posts do really well? Repost it directly from your analytics by click on Repost. Don’t let your best posts go to waste. Analytics Dashboard: Pin your most important analytics graphs to your Analytics Dashboard. This fully customizable area gives you a quick glance at crucial analytics data. Drag and drop to change the order and easily add and remove graphs. Google Analytics: eClincher supports Google Analytics so you can analyze your website as well. Understand how many people visited your website, how long they stayed, where they came from and much more. To understand the effectiveness of your social media efforts, you must also analyze your website traffic.